Ariel Waldman contributes Movie Gadget Friday, where she highlights the lovable and lame gadgets from the world of cinema. Previously on Movie Gadget Friday, we traveled across war-torn galaxies in the 1978 version of Battlestar Gallatica. 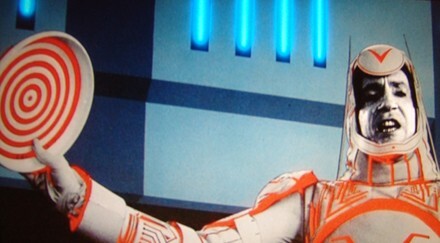 Moving forward a few years to 1982, we'll take a look inside the computational arcade culture of TRON. Saturated with neon suits and Pac-Man blips and bleeps, the sci-fi cult Disney film has achieved pop culture status over the years. Using a matter transform sequence and a grid matrix, the ENCOM Digitizing Laser is able to transport physical matter into a digital space. The laser is able to lock on a target and dismantle the molecular structure on a cubic grid. When used for its original intentions, the molecules remain suspended in the laser beam. However, the Master Control Program is able to deviate this sequence into transporting the restructured molecules into a digitized computer game world where TRON resides. The molecules can then be shifted back safely into the physical world by selecting the run mode through the laser system. Surprisingly, the only side effects the laser has on humans is minor disorientation and temporary memory loss. Phew. More after the break. This mammoth of a desk is featured as the main text-based control panel access the Master Control Program. With a sleek glass surface, the table top doubles as a dynamic touchscreen, doing away with the need for a bulky keyboard (we can only hope it would do away with a lot of other devices for a desk that size). The MCP that runs within the desk was originally programmed as an artificial intelligence chess game, but over time was able to increase its intelligence and conversational abilities through an internal audio input / output system. If the size and MCP weren't intimidating enough, the desk also comes equipped with embedded monitors, capable of displaying multiple CCTV feeds at any given time for spying on potential intruders. 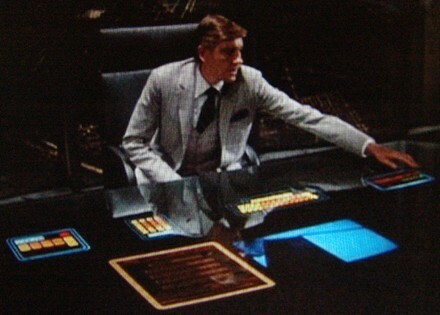 Aside from lasers and computer desks, it's hard not to notice all the virtual devices that are featured throughout Flynn's digitized journey. Since most are bits of software, they're able to take on any form and function despite the usual laws of physics and mechanics. But from Light Cycles and Identity Disks to hovering Recognizers, we tend to have more lasting wonder about the necessity of men in TRON-tights, and less to do with the electrical output levels of Logic Probes. Ariel Waldman is a social media insights consultant based in San Francisco. Her blog can be found at http://shakewellbeforeuse.com.